Several years ago, due to a back injury, I was in a lot of pain. Over the counter pain medicine did not help. My chiropractor told me to make my own ice packs using 1/2 water and 1/2 rubbing alcohol. I used 1 cup of water and 1 cup of alcohol. I put both in a zipper bag, and put it in the freezer. 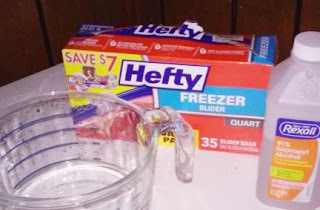 Due to the alcohol content, the mixture will not freeze totally, but instead will be a slushy texture, so that the ice pack will mold around knees, ankles, elbows, and other body areas that a traditional ice pack does not do well for. After some experimentation, I have found that 70% or higher rubbing alcohol works best. Do not use the green rubbing alcohol. If the bag leaks, the green may stain your clothes or furniture. I quickly learned that when you lean back on a zipper bag with a slushy half-frozen mixture in it, it sometimes will cause the zipper to pop open. Not fun, since it bathes your back in icy liquid. I found two ways to address this problem. First, put the zipper bag with the mixture in it upside-down into a slightly larger zipper bag and zip it up. This helps, but does not always work. Second, don't use the zipper bags with the actual zipper on them, like the one in the photo. In my experience, these don't seal as tight when you are working with liquid, and are easier to accidentally open while in use. I use Hefty Slider bags for a lot of things, but not for making ice packs. At the time I took the picture, I didn't have any other brand in the house. Third, the best way to make homemade ice bags is to use a FoodSaver Vacuum Sealing System to seal the bag. Put the mixture into a premade vacuum bag and seal without using the vacuum part of the machine. Be careful to hold the bag so that no liquid gets into the sealing channel. Put the bag in the freezer. Again, it will not freeze hard, but will stay slushy so that it is perfect for using on hard to apply places. Ice bags made with a FoodSaver actually last a long time, and work really well. With a towel between your skin and the bag, apply for twenty minutes, then remove. Leave it off for at least twenty minutes before using again. This will get cold enough that if misused, it can cause frostbite. I am not a doctor. As always, consult your physician for any injury. I am only passing on what my doctor told me. The homemade ice pack works great! Place the ice pack in a closed plastic container, so that if it does leak (if you use the zipper bag method), you will not have alcohol in your food. Place the container in the bottom of the ice chest, and then pack your food around and over the top of the plastic container. The ice pack will keep your food cold as long as, and sometimes longer than, a bag of ice would. For large ice chests, you might need to use more than one container with homemade ice packs in them to keep the food as cold as you need it to be, especially on really hot days. Have you ever made your own homemade ice bags?